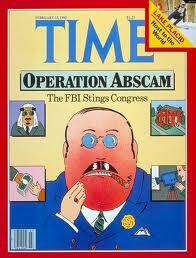 More than 30 years ago the FBI ran a sting operation, known as Abscam that netted seven politicians who were willing to sell their influence for cash. Although the FBI’s tactics were questionable, the results speak for themselves. Seven corrupt congressmen were removed from office including a U.S. senator who was sentenced to jail. I wonder if the FBI went seven for seven on the bribes. Did they offer a bribe to seven congressman and all seven accepted or did they offer the bribe to 28 congressman and only seven accepted. One scenario has a corruption rate of 100% and the other “only” 25%. We will never know the answer, but this is still a good question. How corrupt were the politicians who were running the country in the late 70’s and early 80’s? I also wonder if this type of sting could work in modern times. I suspect not. There are too many legal ways to sell votes and influence. The special interest lobbyists walk the halls of Congress with bags of cash. Their job is to spend the cash where it will do the most good for their clients. Who needs Arab Sheiks? What is truly scary is the reminder that Abscam happened and current congressmen are just as corrupt as their predecessors. Everyone needs money to stay in office, but the new breed is a lot slicker than the politicians who sold out their country for $50,000. Now the going rate is in the hundreds of thousands. We have had 33 years of inflation.